Paris is a cosmopolitan city where roaring life, wonderful museums and excellent science can be found. It was during the XI IUMS conference held in this city that the Pseudomonas book series was ?rst envisaged. On the ?rst row of the auditorium sat a group of outstanding scientists in the ?eld, who after devoting much of their valuable time, contributed in an exceptional manner to the ?rst three volumes of the series, which saw the light simultaneously. The volumes were grouped under the generic titles of "Vol. I. Pseudomonas: Genomics, Life Style and Molecular Architecture", Vol. II. Pseudomonas: Virulence and gene regulation; Vol. III. Pseudomonas: Biosynthesis of Macromolecules and Molecular Metabolism. Soon after the completion of the ?rst three volumes, a rapid search for ar- cles containing the word Pseudomonas in the title in the last 10 years produced over 6,000 articles! Consequently, not all possible topics relevant to this genus were covered in the three ?rst volumes. 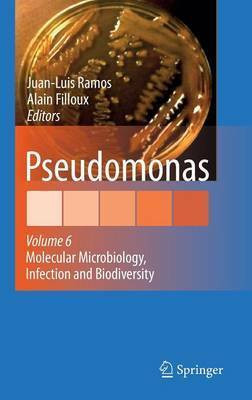 Since then two other volumes were p- lished: Pseudomonas volume IV edited by Roger Levesque and Juan L. Ramos that came to being with the intention of collecting some of the most relevant emerging new issues that had not been dealt with in the three previous volumes. This v- ume was arranged after the Pseudomonas meeting organized by Roger Levesque in Quebec (Canada). It dealt with various topics grouped under a common heading: "Pseudomonas: Molecular Biology of Emerging Issues".